Very Good. This book is in very good condition and will be shipped within 24 hours of ordering. The cover may have some limited signs of wear but the pages are clean, intact and the spine remains undamaged. This book has clearly been well maintained and looked after thus far. Money back guarantee if you are not satisfied. See all our books here, order more than 1 book and get discounted shipping. Good. Ships from the UK. Former Library book. Shows some signs of wear, and may have some markings on the inside. Your purchase also supports literacy charities. Very Good condition with no significant faults. Clearly used but very few minor defects. May look good on your book case after reading but may not be suitable as a present unless hard to find elsewhere SECURE DAILY POSTING FROM UK. 30 DAY GUARANTEE. New. BRAND NEW BOOK! Shipped within 24-48 hours. Normal delivery time is 5-12 days. Very Good. 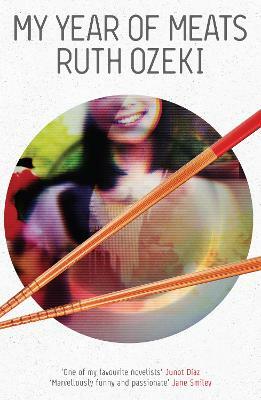 Ruth Ozeki's acclaimed debut novel is 'marvellously funny and passionate' (Jane Smiley) and 'a joy to read' (Elle) B-format paperback. 448 p.
PLEASE NOTE, WE DO NOT SHIP TO DENMARK. New Book. Shipped from UK in 4 to 14 days. Established seller since 2000. Please note we cannot offer an expedited shipping service from the UK. New in new dust jacket. New. 2013. Main. Paperback. In a single eye-opening year, two women, worlds apart, experience parallel awakenings. In New York, Jane Takagi-Little has landed a job producing Japanese docu-soap My American Wife! But as she researches the consumption of meat in the American home, she begins to realize that her ruthless search for a story is deeply compromising her morals. Num Pages: 468 pages. BIC Classification: FA. Category: (G) General (US: Trade). Dimension: 194 x 125 x 28. Weight in Grams: 302......We ship daily from our Bookshop. Copyright in bibliographic data and cover images is held by Nielsen Book Services Limited, Baker & Taylor, Inc., or by their respective licensors, or by the publishers, or by their respective licensors. For personal use only. All rights reserved. All rights in images of books or other publications are reserved by the original copyright holders.